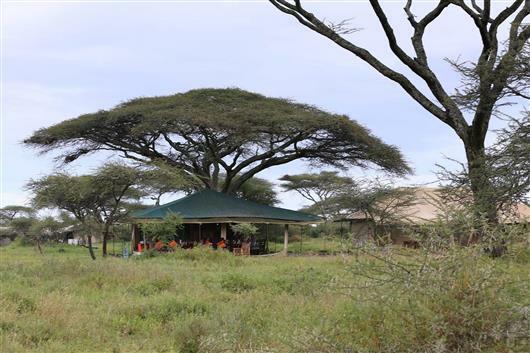 At Nasikia Mobile Camp, we have 8-12 tents that remain mobile throughout the year, depending on seasonal reservation requirements and location of the wildebeest migration. We endeavour to retain the uniqueness and intimacy of the camp, whilst being directed by the location, wildlife and other factors of responsible tourism. 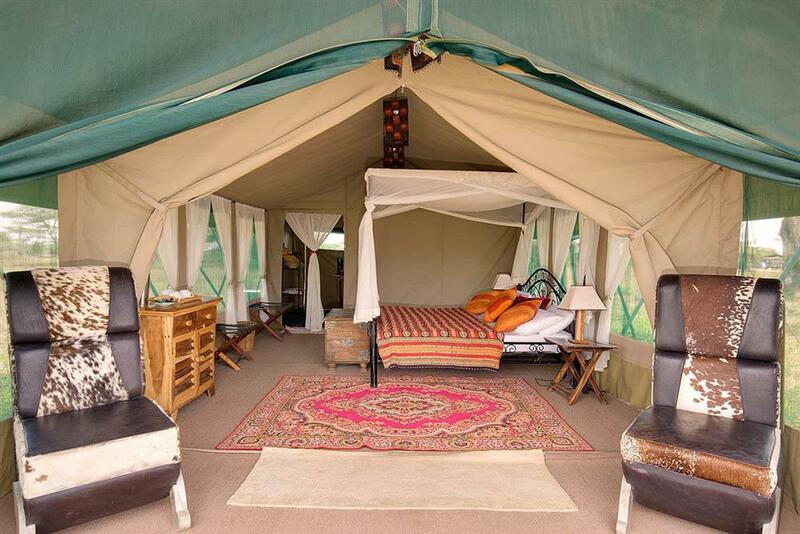 01 June – 31 October – located at Kogatende, in the far northern areas of the Serengeti. This puts us in a great position to game drive to the Kogatende and Mara Rivers in the hope of gaining a view as the herds run the gauntlet of crocodiles as they cross the rivers. This is typically ideal, especially between mid-July and mid-September each year. 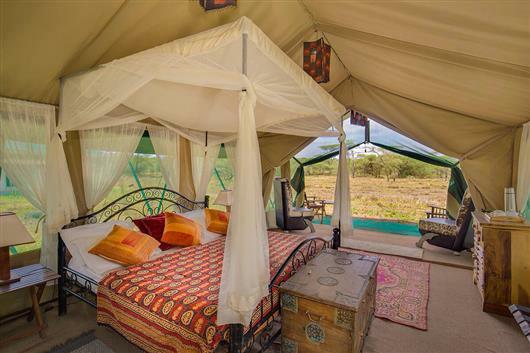 Each tent is 12m long by 4m wide made from well known heavy duty safari rip-stop canvas made locally at Morogoro, southern Tanzania, plus the additional cooling feature of shade-clothing over the entire tent. You are met at the entrance (on the longest side of the tent) by a patio area with chairs and a table for relaxing when you have a moment. The front of the tents zips fully open, including a layer of mosquito netting and the rip-stop canvas (which zips completely closed) with both layers. Once you step into the tent into the bedroom area, you will see an arrangement of unique furniture like a desk and chair, storage chest (with extra blankets), matting, wardrobe with robes, slippers, an umbrella and laundry bag, luggage racks, torch/whistle/camp information folder, bedside tables, bed footers and beds (depending on room configuration). All the fittings depict colours in natural tones to adhere to the intrinsic area we are located. 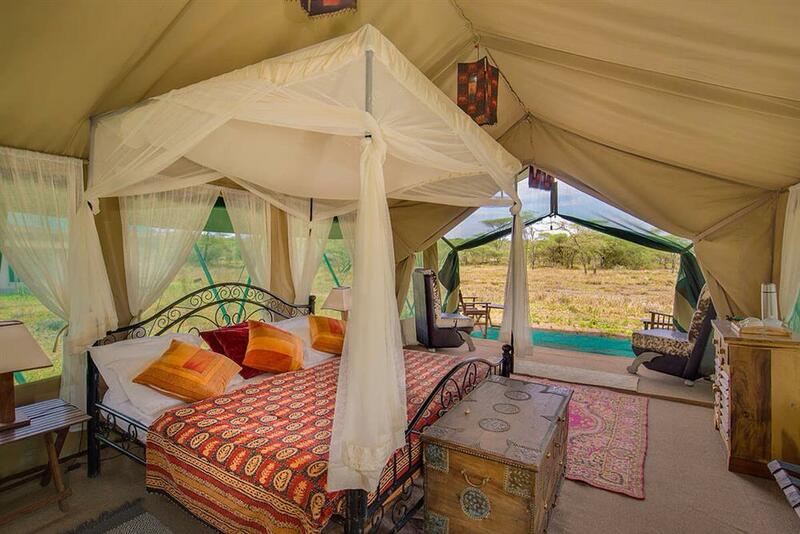 We offer double (even a honeymoon option), twin, single, triple and family (quad) tents and each bed is fully netted for custom made protection from mosquitoes and insects. The beds are fitted with imported cotton sheets, double pillows, duvets and bed runners for your comfort.